Pregnancy Tips and Child Care: Is Baby Powder Safe? Baby powder is a great way to keep your baby smelling sweet and fresh. But it’s better to avoid that extra dab on baby’s soft, gentle skin. Sometimes, the chemicals in the powder, no matter how mild, may just not agree with your baby’s delicate skin and result in irritation and allergic reactions. So the next time around when you reach out for baby powder, do steer clear of those with a strong fragrance (the aroma is nothing but extra fragrance which could cause irritation to your baby’s vulnerable skin). It is also important to avoid powders that contain talc. 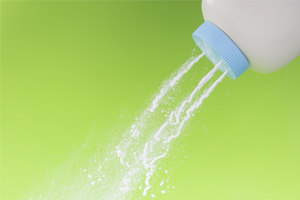 Inhaling the small particles in the talc could be harmful for your baby.